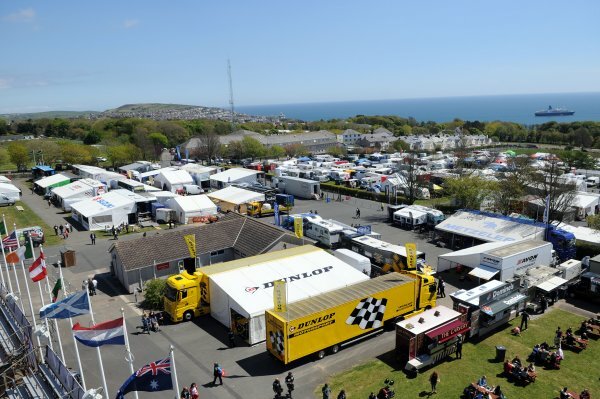 Race fans can follow the action worldwide through the official TT Races app and iomtt.com, which will both feature live Manx Radio TT commentary and live timing. Over 230 competitors will be competing across the solo and sidecar classes with the first session earmarked for Newcomers, Lightweight machines and sidecars. The session is due to start at 18.20 (GMT) with the newcomers controlled speed lap. This year's newcomers will be going out with some of the event's leading names including Bruce Anstey and John McGuinness, while former Honda TT Legends rider Keith Amor and TT rider liaison officers Milky Quayle and John Barton are also involved with the speed controlled lap. Josh Brookes heads a high profile list of solo newcomers that includes the first appearance by riders from Brazil, China and Romania and the first riders from Finland and Holland for almost twenty years. Leading British Superbike Championship racer Brookes will be appearing for the factory backed Tyco Suzuki team and is, without doubt, one of the most exciting newcomers to have graced the Mountain Course in recent years. Austrian rider Horst Saiger will also make his Mountain Circuit debut this evening. The 41-year old has been a regular at the Macau Grand Prix over the last few seasons, recording a superb fifth place at last year's event. Saiger has also competed in the World Superbike Championship and at the Daytona 200. Other high profile newcomers involved in this evening session include South African AJ Venter, the Isle of Man's Gavin Hunt, Dutch rider Branko Srdanov, Germany's Stephen Michels, and the UK's Daley Mathison, Sam Wilson and Jonathan Haworth. Other interesting newcomers include Petre Pop, (Romania) Cheung Wai on (China), Juha Kallio (Finland) and Rafael Paschaolin (Brazil). In addition to their guided lap, the newcomers will also get the chance for some timed laps later in the Lightweight session, with newcomers given the opportunity to ride any machines in the session. The renaissance of the Formula Two Sidecar class on the Island can clearly be seen not only in the entry of over 60, its highest for a number of years, but also in the number of newcomers, which will be into double figures for 2013. Thirteen newcomer sidecar drivers are taking part in this year's races and they'll get their first sight of the track at around 18.35 (GMT) on a speed-controlled lap. The list includes local man Darren Hope who tasted victory as a passenger with Nick Crowe in 2005 and 2006 who is now trying his hand as a driver. The Lightweight class qualifying begins as well this evening for the 650cc Supertwin machines at around 18.50 and the class has again seen major interest with entries from Michael Rutter, Michael Dunlop, James Hillier, Conor Cummins, Cameron Donald and Gary Johnson. With the class offering more of a level playing field, the likes of Russ Mountford, Dan Cooper, Ivan Lintin, Ben Wylie and Olie Linsdell should again feature prominently as should Chris Palmer, who makes his return to the TT after a three-year absence. The first qualifying session concludes with the first sidecar practice, scheduled for 19.55 (GMT) Dave Molyneux, again with Patrick Farrance in the chair, will be looking to add to his record tally of 16 wins. Competition is again expected to come from reigning World Champion Tim Reeves and former World Champion Ben Birchall, the duo again partnered by Dan Sayle and Tom Birchall respectively. 2011 Race champions John Holden and Andy Winkle are back as are Conrad Harrison and Mike Aylott. Superbikes, Superstock and Supersport machines will get their first run out on the Mountain course on Monday evening with the session scheduled to be underway at 18.20.